As one season ends at Nyewood Lane, thoughts turn to 2015-16 – and the Rocks have announced three home friendlies and three away. The big Pompey fixture at Nyewood Lane has been switched from Saturday, July 18 to Friday, July 17. Friendlies: Mon Jul 13 Gosport (h) 7.45pm; Fri Jul 17 Pompey (h) 7.30pm; Mon Jul 20 Pagham (a) 7.45pm; Thu Jul 23 Moneyfields (a) 7.45pm; Mon Jul 27 Worthing (a) 7.45; Thu Jul 30 Havant (h) 7.45pm. The Pompey game will be against the League Two side’s first-team squad and is not all-ticket. Admission prices for all friendlies will be announced soon. But on that note, the Rocks are putting up adult ticket prices by £1 next season. 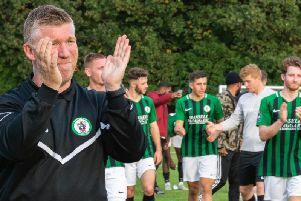 After seven years with no increase and after much consideration, the cost of adult admission goes up to £10 – in line with the majority of clubs in the Ryman premier. Club secretary Simon Cook said: “Season tickets continue to represent extremely good value and about a third of our regular supporters take advantage of these to save from 20 per cent (adults) to 40 per cent (senior citizens). “We plan to change the way in which admission is charged for young people next season. “We experimented with abolishing the entry fee for under-18s midway through the season. “Having carefully analysed the results, we saw no increase in the number of young supporters attending our matches. “However, we recognise the longer-term importance of attracting and retaining younger supporters, and will therefore provide free season tickets to any under-16s. To obtain a free young person’s season ticket, apply to the club shop at any of the pre-season friendlies or between 10am to midday, Mondays to Fridays.